Happy July Third! 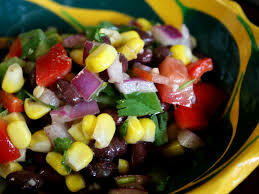 Wow, this weekend just has not stopped with cookouts, pool parties, beach gatherings, and … snacking 🙂 If you need a fresh, easy to assemble, “no baking required” kind of appetizer or side salad, this Black Bean and Corn Salsa can be put together in minutes and does not disappoint. Such a refreshing healthy alternative to heavier dips but paired with your favorite tortilla chip still totally satisfying! Even kids love it… we actually had to tell them to take a break last night so there was some left for others. Hoping you get some time this weekend to relax and enjoy good friends and family! Happy Independence Day! Perfect addition to any snack or dinner or table this hot summer weekend!! Serve with tortilla chips, over scrambled eggs, with grilled/baced chicken, cod/tilapia/haddock, or just eat it as a salad. Sooo… good! In case you are taking a little time to search through property listings this weekend, my team has coverage to answer questions and to schedule showings for the upcoming week. Just let us know what we can help with!! Pingback: Easy Pear Salsa – it’s another good one! | Be Home. Be Well.